On grey days I like carbohydrates and a good laugh. This weekend I’ve savoured spring bulbs, a new pair of hole-free wellies, an old-fashioned joke and a plate of home-made crumpets. Crumpets and I have a long history. I wrote recently about childhood memories of my Great Auntie Susie’s plain, honest Lancashire hotpot. My great auntie cooked suppers of hotpot, ham salad and stew, with the occasional outburst of potato fritters or cherry pie. But my mum, who worked long hours, always made supper on Mondays. The food was exotic, glamorous and occasionally downright revolutionary (I’m thinking particularly of rhubarb soup, tried once and never repeated). Instead of hotpot, she made risotto, chicken with white wine and asparagus, ginger cake with coffee cream filling. There was no connection between the food we loved on Mondays and the recipes we enjoyed the rest of the week. The only overlap – food that appeared in both repertoires – was pickled beetroot, fish and chips… and crumpets. There were sausages too, I suppose, but one version was charred to blackness, the other barely glanced the side of the pan. 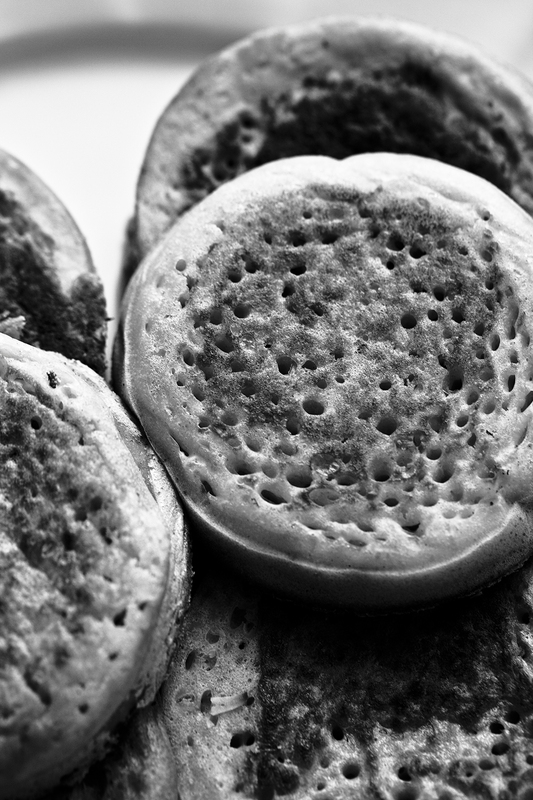 Crumpets – my childhood crossover food – are perfect for grey days. They’re drilled with holes; deep canyons down which melted butter can dive. They’re very British – if you’ve never tried them, you really must. If you’ve tried them but never cooked them… you really, really must. Sieve the flour into a bowl. Add the yeast to the warm water in a separate bowl and stir. Add the milk and sugar to the yeast mixture and stir once again. Pour the mixed liquid into the centre of the flour and, with a whisk, gently combine the ingredients until you’re left with a smooth, runny batter. Allow the batter to rest for ten minutes and then add the salt and bicarbonate of soda. Stir them in and let your batter rest for a further ten minutes. 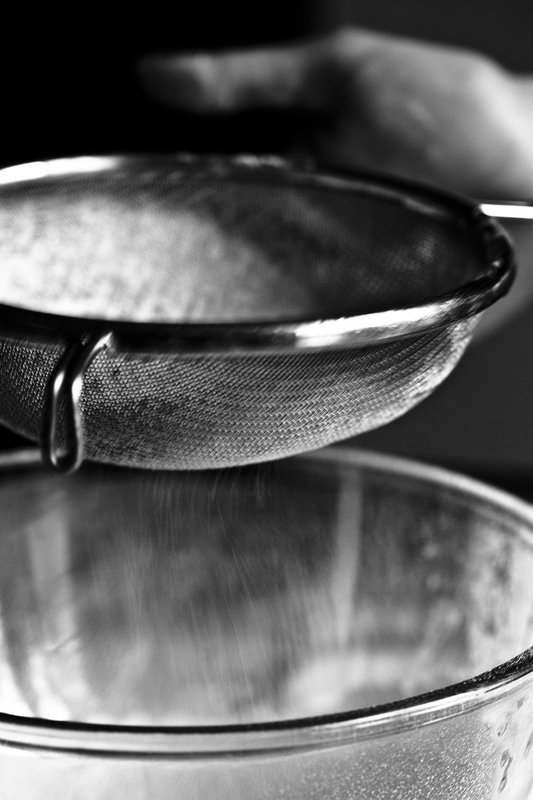 Place the non-stick pan on a moderate heat. Once it’s hot, place the rings in the pan and ladle enough mixture in to reach the half-way mark. Bubbles will form after about a minute. Put the lid over the pan and allow the crumpets to cook for around five minutes. By this time, the mixture will be just about set. Using a plastic spatula, flip the rings over. Push the crumpets down so that the tops of them are now touching the surface of the pan. Allow them to cook for a further minute, until they’re golden brown on top. Remove them from the pan and release them from the rings. 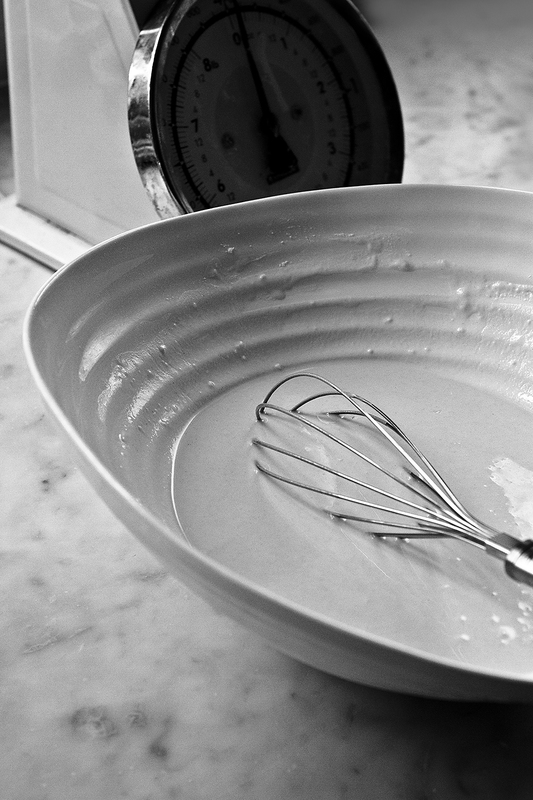 Repeat the process until you’ve finished the batter. Either eat the crumpets straightaway with butter or save them for later, toasting them in the toaster to warm them through. There was a daft phase in commercial bread-making, when a large manufacturer attempted to sell oblong-shaped crumpets. Anyone who’s been brought up on crumpets could have told them it was a terrible idea. I think of myself as someone who was brought up on crumpets not once but twice – on Mondays and every other day of the week too. If the bread factory had only asked me about rectangular crumpets, I could have saved them an awful lot of trouble. Although your overseas readers may not be able to vouch for the moreish nature of a good buttered crumpet,i certainly can! I would just like to add that the new chiaroscuro-esque pictures are great! You sound as though you’re a crumpet expert. They’re the perfect food, I agree. And I’m so pleased you like the black and white experiment – thank you very much. As a child we were brought up on crumpets with them being our after school treat and Sunday morning special. Although being from Yorkshire they have always been known as pikelets with crumpets being the more bready, toast in front of the fire bun. My grandmother always made them from scratch on a range oven and I loved to watch the bubble eruptions as they cooked. As a teenager we managed with the store bought varieties until, as a mother myself , I started to make them with my own children. What had we been missing! Memories flooded back and what a difference to store bought! Oh and black/white is good, I love the clarity it brings to an image. Hi Dee What great memories you have of crumpets and pikelets. I love the vision of your grandmother at the range, cooking them for a Sunday morning treat. Isn’t it a revelation when you start making them yourself? So satisfying to see those little bubbles form. I’m very glad you like the black and white pictures – an experiment I think I’ll repeat. Thanks so much for leaving a comment – it’s very much appreciated. Fascinating. For some reason it had never occurred to me that you could make your own crumpets, or that the source of the holes is bicarb. The B&W pictures are also a triumph. No wonder the ace photographers of old stuck to them long after colour arrived on the scene. Indeed some of today’s still love the elegance of monotones. The word ‘classic’ comes to mind. The impact of black and white is mesmerising, isn’t it? Whenever I turn to monotones I feel as though I won’t use colour again. I can’t explain exactly why. But, on the food front, you really should try making your own crumpets – they’re good. Beautiful photos, Charlie. Have to say I never quite fancied crumpets growing up, but my wife has more of a penchant for them and each time she has them nowadays, I love trying them again. 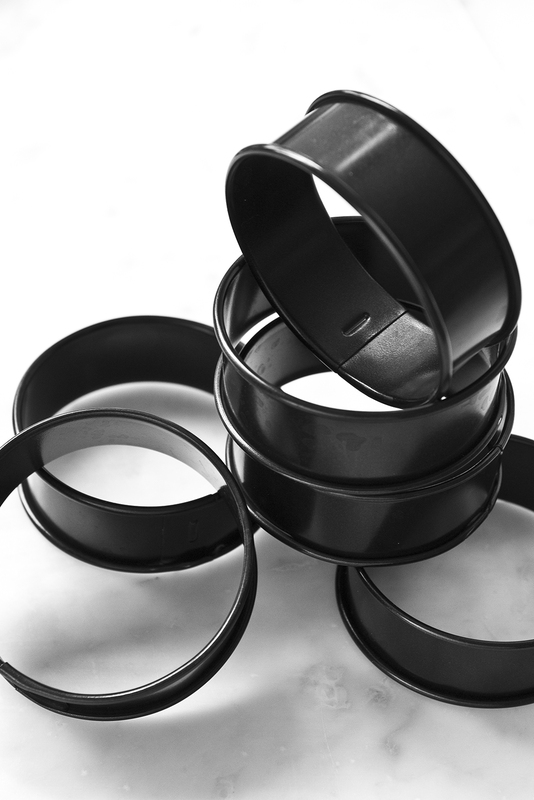 There’s nothing quite like them, especially in your monotone shots here! Thank you, Matt – I’m so happy you like the pictures. There’s something magical about black and white photographs I think. And crumpets too. My son has them every single day, with mountains of peanut butter. I’m delighted that my teens have inherited my love of crumpets (and love of Marmite too). This is a kick to make them from scratch, which I have never done. Great step by step instructions and lovely monochrome pics. I’ve been taking a few myself recently and loving the results. The pools of melted butter that drip through the holes combined with something sticky (golden syrup was our childhood choice) wiped up with the last bit of crumpet is a joy not to be underestimated. Fascinating that you have such a clear memory from childhood, not just of the taste but the look and the ritual too. Crumpets are so much more than they at first appear. Better still – next time you’re in the UK I’ll make you some, Jamie. 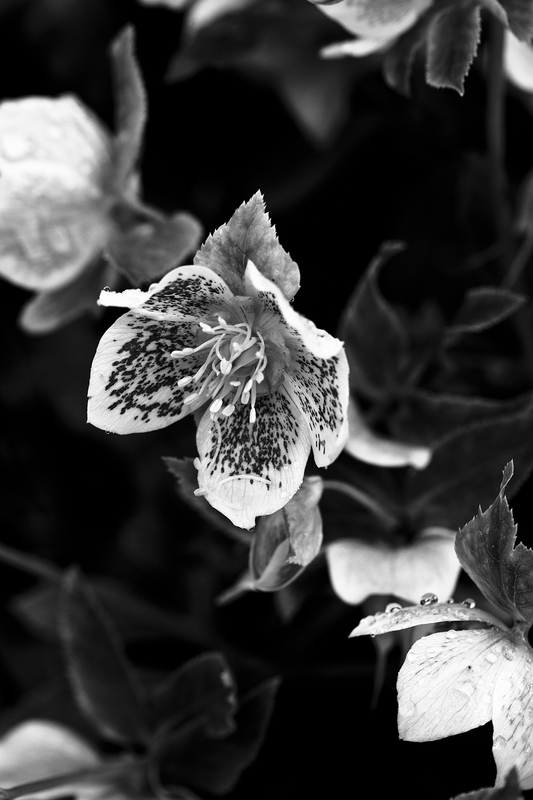 It was hugely pleasurable using black and white again. It’s something I haven’t done in a long time, but plan to do more. There’s something, as you say, so expressive about b and w. So glad you liked the pictures. I have just wasted a good hour looking through your lovely blog which I discovered today! Photos are beautiful as are the recipes. Thanks so much for writing, Jannine – I always appreciate it very much. I hope it wasn’t a ‘wasted’ hour exactly! Of course I am absolutely delighted that you’re enjoying Eggs On The Roof. I too have just discovered your wonderful blog. I feel inspired to use your crumpet recipe, something I have always wanted to do, but never felt brave enough, as I couldn’t imagine they would turn out “right”. 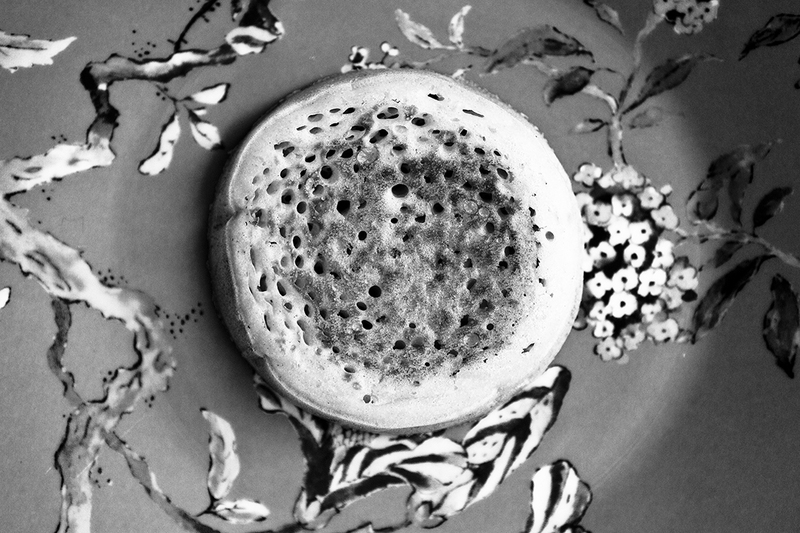 I’m going to have a go at these … I just love crumpets, butter oozing through the holes … yum! Welcome to Eggs On The Roof, Chris – it’s great to hear from you and thank you for your lovely comment. I hope you try the crumpets. Hello Shuhan – great to read your comment. Actually, it made me laugh which is only right since I made you laugh too. Thanks very much for dropping by. Wonderful pictures – especially the snowdrop! And embarrassingly, I am in the “enjoyed then but have never made them” camp with crumpets. Must rectify immediately! As you know better than anyone, making them yourself seems to make them extra good, Jeanne. I absolutely love crumpets and every time I visit Jeanne end up buying enough to bring back home. I’d love to try making them at home. Thanks for the inspiration and the recipe Charlie! The recipe does work really well, Meeta. I hope you find it creates the crumpets of your memory! 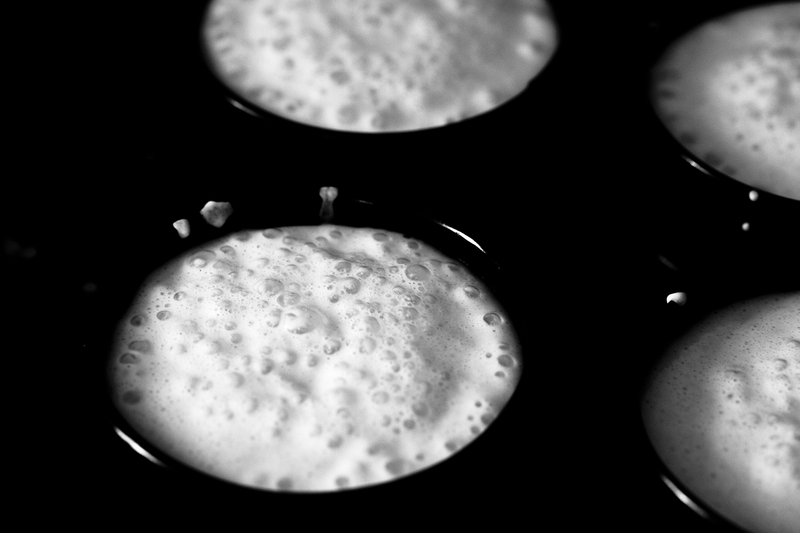 I am so pleased that you enjoyed making and eating the crumpets – thanks so much for letting me know. The bubble question is a tricky one. You need the acidic part of sugar to react with the bicarb, so reducing the quantity of sugar you use may be part of the problem. Bicarb also has a very definite shelf life, so check that it isn’t past its sell-by date. Make sure you’ve mixed it in properly so that it’s fully dispersed throughout the mixture. Once mixed, don’t leave it too long before you start the cooking process. I hope that has the desired effect! 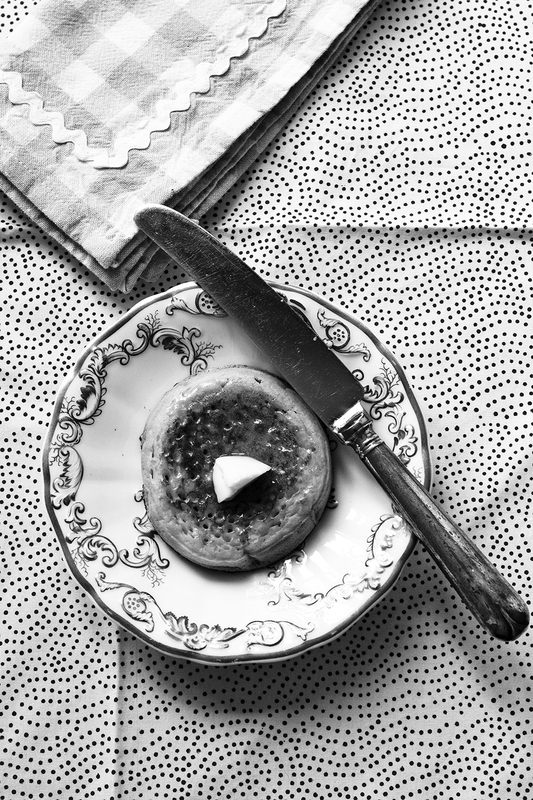 Oh – tears of nostalgia came to my eyes – I haven’t had crumpets for years, but they were always a winter treat, oozing with butter and with a mere wisp of marmite, eaten by a roaring fire after a dreary winter walk. They were always bought though – I had never thought of trying to make them myself. I don’t think we can buy them here in South Africa, so I haven’t had any since we moved here. Now I have to go and find some baking rings so that I can indulge myself with childhood taste memories and see if my children will like them as much as I do. Thanks for this recipe and for making them sound so easy! Do, please, let me know if you make them, Kit. I love the thought of crumpets travelling all the way to South Africa and, hopefully, making your children as fond of them as we are. And I agree that a ‘mere wisp of marmite’ is just what crumpets need.